A new window film from Designtex takes its cues from science fiction. Open offices are privacy nightmares, especially if you’re trying to hide sensitive data on screens. 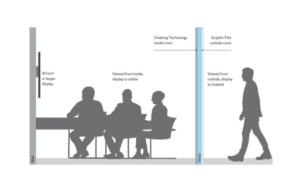 But since open offices aren’t going a way any time soon, there’s Casper: a new product from the applied materials company Designtex that works like a cloaking device. When applied to a glass wall or a window, Casper blacks out screens behind it. The transparent window film blocks light waves transmitted through LCD and LED screens. This makes them look like they’re turned off. Everything else in the room looks completely normal. While privacy screens have existed for laptops and individual monitors for quite sometime, Casper brings it to the architectural scale. It’s like a Romulan cloaking device come to life. Comments Off on A Real Life Cloaking Device for your office ?